On August 6th 2015, Coca-Cola Enterprises (NYSE and Euronext Paris: CEE), an independent bottler of Coke products in Europe, agreed to a three-way merger with two other bottlers in that region: Coca Cola Iberian Partners and Coca-Cola Erfrischungsgetränke AG. This transformational transaction will create the world’s largest independent Coca-Cola bottler based on net revenues of c. $12.6bn expected in 2015. 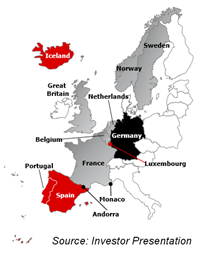 The combination of Coca-Cola Enterprises (CCE), Coca-Cola Iberian Partners (CCIP) and Coca-Cola Erfrischungsgetränke AG (CCEAG) will create a company serving a consumer population of over 300 million in 13 countries across Western Europe. The combined company, Coca-Cola European Partners (CCEP) will operate in four largest markets for non-alcoholic ready-to-drink beverages in Western Europe – Germany, Spain, Great Britain and France. CCEP will control more than 50 bottling plants and c. 27,000 associates with a leading position in every country. The broader European geographic footprint will allow CCEP to compete more effectively across non-alcoholic beverage categories. The new combined company – CCEP – is expected to become the largest independent Coca-Cola bottler based on net revenues. Pro forma net revenues and EBITDA in 2015 are expected to be around $12.6bn and $2.1bn, respectively, with a volume of 2.5bn unit cases. Although one might expect the Coca Cola Company is in charge of every activity concerning the production and sale of its beverages, the system in place proves to be more complicated. The Coca-Cola Company only produces concentrates, syrups and beverage bases and owns all the brands, which are known to the customers. Furthermore, they organize all marketing efforts and other initiatives which may carry their name. The actual bottling, packaging, merchandising and distribution of the finished products is nowadays undertaken by over 250 partners, which are independent managerial and legal entities inside a franchise system. Usually, these companies own the exclusive rights for distribution in the assigned markets and undertake the above-mentioned activities. The Coca-Cola Company’s own bottling operations were combined in 2006, forming the Bottling Investments Group. This subsidiary serves two different purposes in the strategic structure of the Coca-Cola Company: firstly, the Coca-Cola Company wants to guarantee a certain control over the bottling businesses as not to loose negotiation power. Secondly, they invest in companies, develop them and provide technical guidance, in order to create stable businesses, in line with the high quality standards of the brand. The Coca-Cola Company sequentially looks for a bottling company to continue the business in the local market under its franchise. However, the company often remains a shareholder in these companies and encourages consolidation to increase financial and operational synergies. The ongoing merger of Coca-Cola Enterprises, Coca-Cola Iberian Partners and Coca-Cola Erfrischungsgetränke AG serves as a good example for these consolidation efforts in Western Europe. Coca-Cola Enterprises’ (CCE) shareholders are forecast to own 60% of the new Coca-Cola European Partners (CCEP) shares based on the split of revenues, which total $14bn annually. The terms of the deal were made known on August 6th and Coca-Cola Enterprises will eventually own 48% of the combined company, while Coca-Cola Iberian Partners and The Coca-Cola Company will own 34% and 18%, respectively, on a fully diluted basis. CCE’s shareholders will receive one share of the new company and a one-time cash payment of $14.50 for each share owned. The aggregate cash payment of $3.3 billion will be financed through a new debt issuance. The Coca-Cola Company (CCC) has long held tight control over its supply chain, even though a significant portion of bottlers is independent. Analysing the payment structure of the deal it is clear that The Coca-Cola Company, represented here by its subsidiary Coca-Cola Erfrischungsgetränke AG, will further extend its influence over the supply chain by increasing its stake and financing the operation through newly issued debt. In support of this plan, together with the new CCEP, it will enter into a new 10-year bottling agreement with an option to renew for an addition 10-year period. As far as governance is concerned, the current Executive Chairwoman of Coca-Cola Iberian Partners will become the Chairwoman of the combined entity, while the current Chairman and Chief Executive Officer of CCE will assume the CEO position of the new company. The Boards of Directors of all the parties involved have approved the transaction, which is yet subject to approval by CCE’s shareholders. The Coca-Cola European Partners will be headquartered in London and traded on the Euronext Amsterdam, NYSE and Madrid Stock Exchange. Deutsche Bank advised The Coca-Cola Company, Lazard and Credit Suisse advised Coca-Cola Enterprises while Rothschild was the advisor of Coca-Cola Iberian Partners. The soft drink industry mainly consists of two different subindustries that came to be defined under the manufacturing sector: flavouring syrup and concentrate manufacturing and soft drink manufacturing. The former offers a wide array of flavouring syrup concentrates and powdered concentrates to be sold to soft drink producers and grocery wholesalers whereas the latter blends water, liquid beverage bases and sweeteners and then the finished good is destined to household consumption. The future growth prospects for both subindustries are correlated and are forecasted to stand out in the entire manufacturing industry. This must be put down to the presence of two globally known companies that retain the majority of the U.S. market share the Coca – Cola Company and Pepsi Co., Inc., which let local producers transfer unexpected surges in input costs and bear high margins. The industry revenue experienced an annual 0.8% increase up to $8.3 billion in 2015. However, the flavouring syrup and Concentrate Manufacturing industry has recently fallen on hard times because of the radical changes in the consumers’ consumption patterns caused by an increase in health consciousness. That being said, it is important to point out that this great attention to healthy beverages is driving consumers to substitute carbonated soft drinks (CSDs) with sport and functional drinks. The growing demand for the latter explains the higher growth rate of 1.8% that the soft drink industry has experienced between 2010 and 2015. Both subsectors are characterized by a relatively different customer base and distinct selling products. Yet, the main key player in both markets is represented by the Coca – Cola Company, accounting for 40% and 28.6% (as of Q2 2012), respectively, of the total U.S. market share. The company is an American multinational corporation specialized in the production and marketing of non-alcoholic soft beverages and operates in five main segments: Eurasia & Africa, Asia Pacific, Latin America, North America, Europe Bottling Investments. Each segment pays heed to a different strategic goal and, in particular, the Bottling Investments segment is committed to cost management along with marketplace execution and productivity. The three-way bottler merger will have an impact on this segment, generating as much as $375 million within three years.